Some 'very special' art was created at Tutored by Nature Inc's workshops at EcoBuzz's Conference, November 4, 2010. All winning art/photography and honourable mentions can be viewed - see slide show. 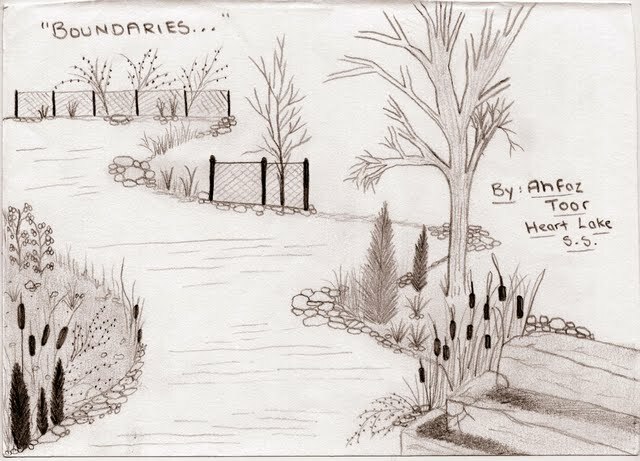 The winning sketch ($85.00 gift certificate from Henry's) is titled "Boundaries" (above left - Heart Lake S.S.). It's difficult to believe that this 'naturalist/artist' composed the work in 30 minutes - move over 'Group of Seven'. WOW!. The 'Photo Series' winner (see above right - Streetsville S.S.) included 3 amazing subjects - titled "Leaves", "Red Plant", and "Canada Geese" were also very special ($85.00 gift certificate from Henry's). The Naturalist Group award (4 - $20.00 gift certificates from DeSerres and Tutored by Nature Inc). I can give away the titles/schools for the work submitted - pencil sketch "Nature's forgotten Friendship" (Streetsville S.S.) - pencil sketch "Beautiful Berries" (Mountain Ash M.S.) - photograph "wandering violet" (Streetville S.S.) - water-colour sketch "Water Fowl" (Chinguacousy S.S.) Can you guess if it's your team?